In 2007, Yamin and two fellow faculty members made a State Department-sponsored “Rhythm Road” tour, hitting eight cities around the world in four weeks. In Mali, bassist Ari Roland, drummer Alvin Atkinson, and Eli jammed with the Bamako Orchestra. Their hosts in Kolkata and Chennai, India, invited them back; Eli returned a year later. In southern China, the band visited Guangzhou and the Sichuan Conservatory of Music in Chengdu, which was struck by the huge earthquake less than a year later, in May, 2008. Once home, Eli decided to take the Rhythm Road rhythm section and two favorite saxophonists into a New York recording studio. Chris Byars has been a musician since he was only six years old. Up to age fourteen, he sang with the Metropolitan Opera chorus. Since he shifted his full attention to jazz, Byars has rediscovered and beautifully arranged music of several not-well-known instrumentalists (currently vibraphonist Teddy Charles), performing alongside these players when possible. Chris moves among projects with the ease he switches instruments; he plays soprano, alto, tenor and flute on the album. 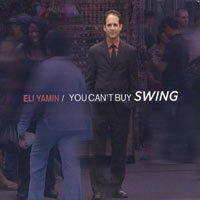 It took just one day in the studio, with no redo’s or overdubs, to record “You Can’t Buy Swing”. Chris didn’t choose which saxophone to play on which song until the moment. First he plays soprano on “I Want to Be a Teacher.” The title refutes the old saying “Those who can, do. Those who can’t, teach.” By the way, drummer Alvin Atkinson prefers a twist on that saying – “When you teach, you learn twice.” Bassist Ari Roland takes a bowed solo, swinging and cool. “Getting Somewhere” is a new slant on “Out of Nowhere.” Eli wrote it during cancer treatments (successful). Alvin’s drums set up “Bop To Normal,” with Chris on tenor and Ari bowing another solo. “Rwandan Child” is the heart of the album. I asked Eli how – when in the studio – he holds onto his concentration through complete takes. Wouldn’t it be easy to charge ahead, to stumble? His answer is that the group dynamics carry this band, and “Just One” showcases the interaction. Benjamin plays the bluesy alto on “Katiana’s New Start,” and Atkinson’s drum solo is so melodic that it could stand alone as a button on a radio show. Byars delivers a prayer of a tenor solo on the slower “Jacquet’s Meditation.” Yamin plays the foil as Roland has a dialogue between his arco and pizzicato (bowed and plucked) selves. “Waltz on the Hudson” features Byars on flute. the essence of his jazz to infiltrate your community. He feels that society has undervalued several generations of musicians who created more than music. Why, just last week Eli was teaching non-musicians on the Jazz at Lincoln Center staff to play Latin rhythms – the clave, cascara and tumbao – and then fit the parts together as a model for teamwork.